I figured I would show you all the mod I have been working on, it has recently come to the point where I've released it to other PA players. I plan to update it over the coming weeks and months, here is the link, a trailer video and a small description. I hope you like it! Replaced the Guards with Deputies. Prisoners are now known as Inmates. Additional floors.... you now have carpets at your disposal! Room size and required item changes, (EG - Smaller Cells, Kennels). Many retextured items, people, inmate uniforms, walls and floors. Female Warden and the Accountant has been replaced with a Secretary. Maxsec has now been changed to the Segregation unit (AKA - Administrative Segregation). Nice Mod (especially since you're new to the forums)! I'm having lots of fun trying out the modding of PA. Someone posted this bug, which seems to be caused by something you do in the mod. Without the mod the amount of 'tired' staff seems to be normal. Sumurai8 wrote: Someone posted this bug, which seems to be caused by something you do in the mod. Without the mod the amount of 'tired' staff seems to be normal. Sorry I've only seen the replies now. That wasn't a feature of the mod, something messed up with it. But its resolved now. I've added some new things recently as seen on the changelog. Someone can share this mod again? 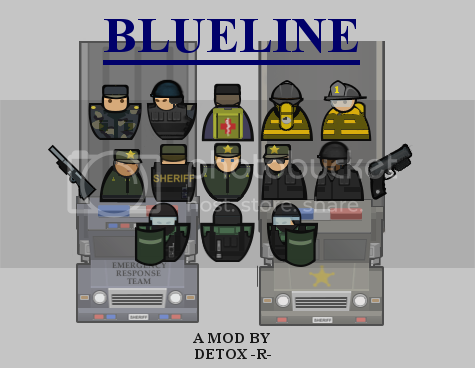 mod blueline Article is Very Good Shared But I Want Every Details About This Article.